Former President Goodluck Jonathan and former Vice President Atiku Abubakar on Wednesday expressed optimism that the Peoples Democratic Party (PDP) would return to power in 2019. They said the party is getting stronger. They spoke with journalists when the ex-President hosted Atiku at his home in Yenagoa, Bayelsa State. On PDP chances in 2019, Jonathan said in a statement issued by his spokesman, Ilechukwu Eze, that the party is better poised to win next year’s presidential election. He said: “Yes, we had some issues in 2015. But as you know politics is a very dynamic business. I believe PDP is coming back and getting stronger. 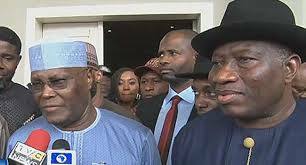 Jonathan said he was pleased that the former Vice President who came to Bayelsa to commission State Government projects paid him a visit. 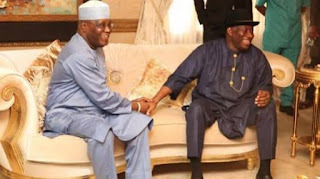 The ex-President said he had enjoyed a long relationship with Atiku, beginning from his time as Deputy Governor of Bayelsa State. 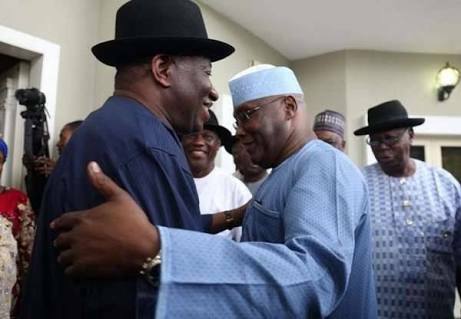 Atiku insisted that only the PDP has the strength and structure to win the presidential election in 2019.